Trying to clear the snow without the adequate tools is always a pain, but finding the best 4-wheeler snow plow can be a challenge. And that is particularly true in a market in which there is a huge number of alternatives. So, to make things easier for you, we had a look at the top models and we concluded that the WARN 78954 snow plow is the first option to consider. Its main advantage is that you can mount it on any vehicle, be it a UTV or ATV. It is also a highly durable plow, being made of a 12-gauge thickness steel. You can easily adjust its height with the help of the spring system that it employs. However, if you cannot find this 4-wheeler snow plow for sale, have a look at the MotoAlliance DENALI 60 inch model, which is next on our list. You can mount it on many vehicles and it is very versatile. It has increased stability and rigidity and that is due to the center-mounted system. Offering a steel of 12-gauge thickness, it has the sturdiness needed and it allows for clearing the snow fast. Additionally, it has a great spring system that allows the driver to adjust the height. This is only the blade, a part of the kit. The base and the mounting kit must be purchased separately. The width and height of this blade offer just enough maneuverability while the strong steel ensures it will last a good while. The large surface, measuring 60 inches in width makes it one of the biggest plows in its category. It is capable of removing large amounts of snow at once. It comes with all the necessary parts to mount it on the vehicle and thus it can be used straight out of the box. The blade is heavily reinforced horizontally and vertically. The instructions and illustrations aren’t clear enough and they only offer a vague image of how the plow should be mounted. This is a big plow that will require a lot of force to action but it will let you clear the snow fast. You can mount it on various vehicles. This blade stands out due to the nice-looking design. The angle at which the blade can be positioned makes it easier to clear snow at different terrain heights. It is covered in a low-friction powder that makes sure snow doesn’t attach to it. The wear bar is impressively sturdy and the angle it’s positioned at ensures great scraping. Being made of strong steel comes with the disadvantage that this plow is very heavy, reaching 80 pounds. This makes it difficult to operate. It’s a highly adjustable model, that allows you to modify the height at which it operates. Its shape makes clearing snow easy. Even if you have the best 4-wheeler for plowing snow, you still need an actual plow to do the job. 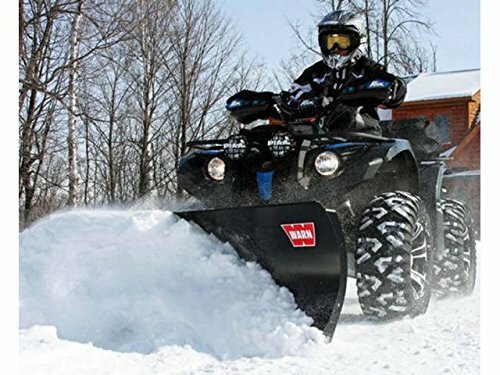 So we’ve critically analyzed the most popular models on the market, and, to ease your decision-making process, we comprised this list of 4-wheeler snow plow reviews. Measuring 54 inches, this plow provides enough width and maneuverability. It is a component of a three-part system, where each part is sold separately. You will also need to get a push bar and mounting plate in addition to this blade. It’s highly versatile but it particularly suits models like the 1979 MTD tractor, the 2013 Polaris 400 HO and the 2009 Arctic Cat 700. The center-mounted system helps the plow offer stability and rigidity to the vehicle. The steel is heavy-duty and has a 12-gauge thickness. This offers it the sturdiness needed and the ability to clear snow faster. This model stands out due to its ability to clear snow on surfaces of different heights. The tension is relieved every time the vehicle moves the plow over rough terrain and that is accomplished with the help of an effective spring system. This model impressively measures 60 inches across, making it one of the biggest in its class. 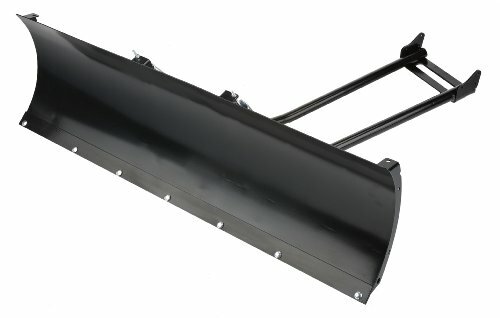 The large dimensions of this plow will allow you to clear large surfaces of snow at once, but you need to make sure that you have the horsepower to back that up. It’s a design made to provide a larger clearing surface and it is versatile enough to be mounted on different ATV and UTV models. Unlike other products, this one comes with all you need to start removing snow in one package. It has the blade, but it also provides two wear bars, the push tubes, adjustable skid feet, the hardware needed for installation and the instruction to do it. The steel used should be sturdy enough to last you more than one winter and it has an 11-gauge rating. It is heavily reinforced – four ribs with a gauge of 7 run the full height of the blade and the deepest part of the blade is supported by 3 stabilizers. 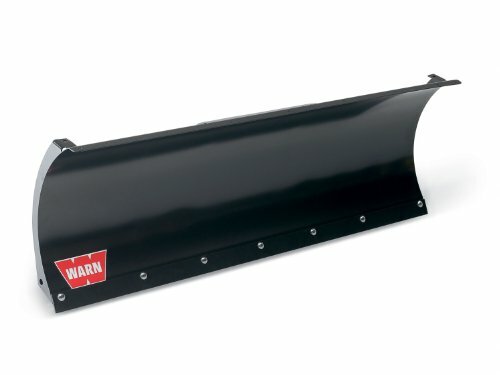 The Warn brand is one of the leading ones when it comes to producing plows and that is why this model is on our list. It features a beautiful look and it can clear snow from different heights due to the steep angle it has. It has a tapered design, meaning that the angle is reduced towards its ends and that makes it very efficient at clearing snow. You won’t have the common issue with snow attaching to the blade and that is mostly because of the low-friction powder that covers the metal. The wear bar is very thick and impressively sturdy and it has a steep angle, a thing that provides maximum scraping. Please note that this is only the blade and you will need the Warn ProVantage snow plow attachment for 4-wheeler to be able to use it. The width is 60 inches, which is enough to be used by an ATV driver or for a UTV snow plow. Measuring 60 inches in width and 16 in height, this plow is efficient at removing large amounts of snow in a single thrust. The steel used in making it is a high-quality one and it comes in a great looking polished black finish. The skid pad that this plow benefits from makes it very useful in allowing the mechanism to be used on different terrains. The plow has a mechanism that allows it to move the blade in six different directions. This will provide more control to the driver and it will allow the vehicle to be more maneuverable. Unlike other models, it mounts behind the wheels and attaches to the frame of the vehicle in multiple points. This makes it have more force and more stability and thus it’s able to move the snow better. 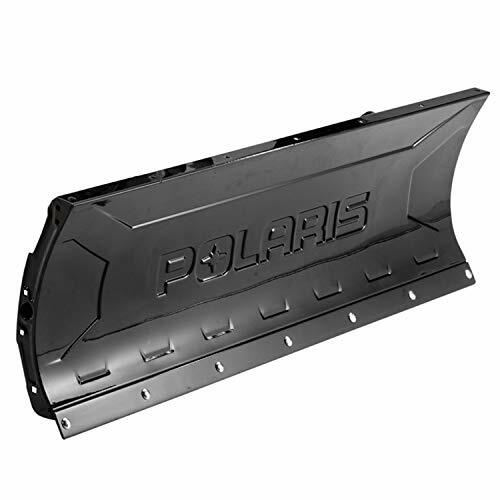 The 4-wheeler snow plow mount is included in the package and the plow is ready to be used immediately after it’s installed. Furthermore, the installation shouldn’t take too long. 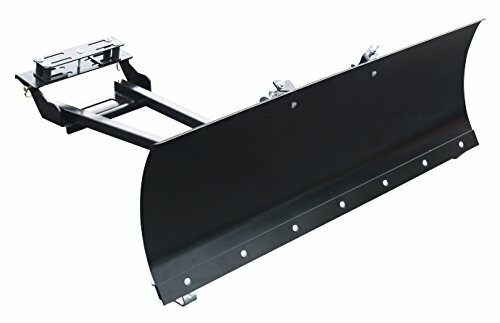 Due to its heavy-duty steel gussets, the blade of this plow is capable of withstanding intense work conditions and it will let you remove large amounts of snow at a glance. Probably the most important feature of this model is the universal hybrid mount that will allow you to attach it to any 4-wheeler. The blade is 48 inches wide, which may not seem impressive to some, but it is able to provide a sufficiently large surface while allowing your vehicle to still be agile. You won’t have the issue of being too slow because you have to push so much snow. The mounting system is simple and the plow comes with instructions on how to be mounted. The wear bar is strong and uses eight quality high-grade bolts to be mounted to the main body. The bolts offer the sturdiness needed but also make it easy for you to replace the bar if you need to do so. 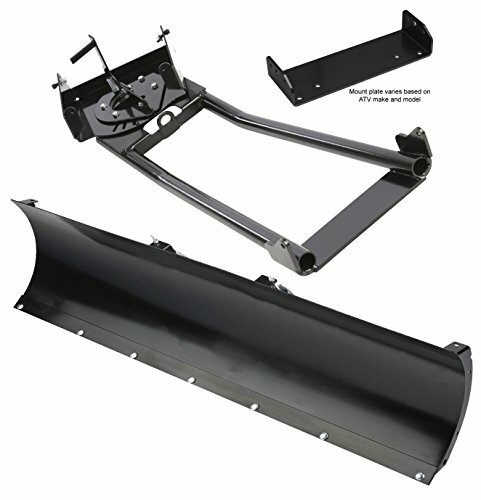 Constructed to provide efficiency at an affordable cost, this plow kit will help you get all the benefits that a quality plow can provide without too much effort. The blade that it has provides resistance and it is strong enough to be intensely used. Its strength is given by the 11-gauge steel that it’s made of, and by the 7-gauge steel ribs that reinforce it. Further support is provided by 3 additional stabilizers that run horizontally and back the deepest point of the blade. The frame is constructed in such a manner that it spreads the force of the snow applying pressure on the blade equally across the 4-wheeler. Thus, the energy is dispersed, making clearing the snow an easier task. 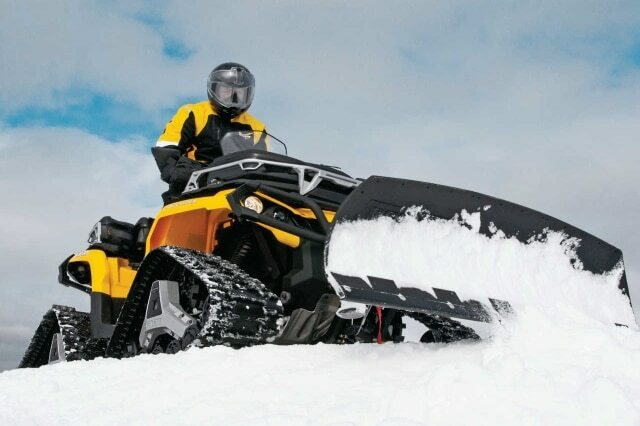 It’s a suitable model for many Honda Rancher types but it can also be used as an ATV snow plow on other similar models. The plow offers enough versatility, as it can be coupled with a winch to increase the speed and stability when operating it. This plow is made of sturdy steel and it’s 17 inches in height, slightly more than usual blades. It’s also 52 inches wide, which is enough to offer you the possibility to remove the snow in tighter spaces. The blade is very easy to mount and take down. That is due to the Lock and Ride Technology, a trademark of the brand. Users are happy that the blade comes pre-assembled and ready to bolt up. The manufacturer doesn’t offer too many details about this product but if you search long enough you will find that the steel used has a gauge of 14, which means the blade is actually very resistant. Although very strong, the plow doesn’t feature a coating that prevents snow from sticking to it, so you will have to occasionally wash it with soap and water to remove it. You should also know that the blade and the rest of the parts are sold separately. Of course, you ideally want to get a cheap 4-wheeler snow plow, but without running the risk of it being of poor quality. This is where certain factors come into play. We have mentioned some of the most important of them below. We believe that when purchasing a snow plow, you should take the following things into consideration. When looking for UTV accessories, durability is the main point to consider, as UTVs go through a lot of physical stress when in use. The same thing applies to ATV accessories. Because it has proven its sturdiness in most industries, steel is a widely used material in making snow plows. It is not only more durable than other materials, but also cheaper. But that comes with the disadvantage that it rusts over time, and this makes the blades have a shorter life duration. Some models come with a special coating that keeps humidity away, but even those will suffer from rust. Another disadvantage is that, after prolonged use, blades made of steel will start to produce a rattling noise. Polyethylene, or poly, is another popular material when it comes to producing blades. It comes with the advantage of being highly ductile and it also has a high-impact strength. It produces less friction, something that is needed when clearing snow. Being highly resistant to scratches and dents, it is a great choice for tough winters. Blades made of poly have the capacity to retain their form and color even after prolonged use, and their smooth surface and composition make it easier for the snow to slide off them. On the other hand, this material brings a higher weight to the plow and also a higher cost. Although light in appearance, the framework needed to support this kind of plow is a lot heavier. Stainless steel is the most recent alternative in the snow plow industry. Being an improved version of the steel variant, it adds to its qualities, improving the durability, appearance and makes the blade more scratch-resistant. As you know, stainless steel does not rust and the color doesn’t fade away too easily. This helps with keeping the blade nice-looking for longer. You might be tempted to use the biggest blade there is, but you should also know that depending on your vehicle’s power, certain plow dimensions are recommended. If your 4-wheeler packs 450cc or lower, you should be looking at plows that are around 50 inches wide. 60-inch blades are made for ATVs with a power of more than 450cc. Wider than that, and you will need a UTV to use such a plow. The same principles are applied when discussing the height of the blade. Narrow blades are more suitable for vehicles with a smaller engine capacity. You want your vehicle to still be capable of pushing through the snow. There are 3 main blade shapes used in the industry, each coming with its own advantages. The first of them is the straight one. This one is good because it offers simplicity and versatility. You can change the angle you operate it at, to offer the best clearing. A V-shape model is great for breaking through packed snow or ice. The containment model is great for more powerful vehicles that are used to move snow around. A good 4-wheeler snow plow is one that can be adjusted to different angles and heights. This makes it easier for the driver to haul more snow. 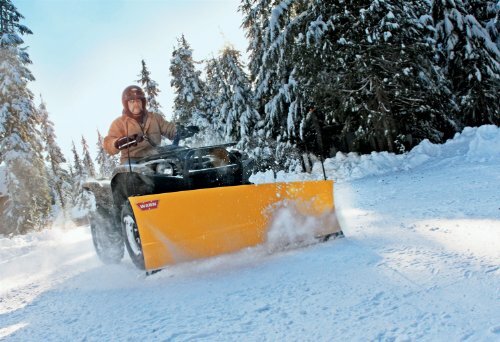 If you want to be really efficient and clear snow in any condition, you need a blade capable of being set in at least 6 modes. Because the level of the snow varies, depending on the storm intensity or the terrain you are plowing on, you should be able to modify the plow’s position easily. The angle at which you approach the snow will have a big impact on how well you progress. 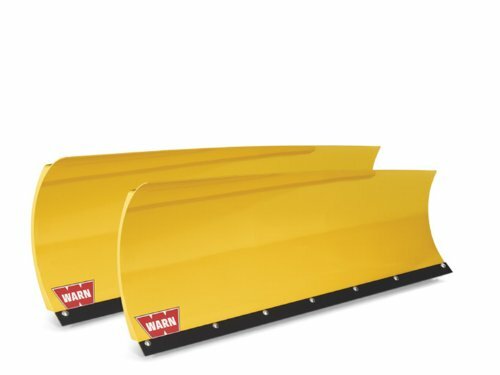 A well-positioned blade will make your plowing efforts a lot easier. If you feel that you’re struggling in deep snow, consider mounting some UTV mud tires on your vehicle. For even more safety, we would also recommend the use of a UTV winch in deep snow. Riding with a snow plow attached should not feel like a burden. 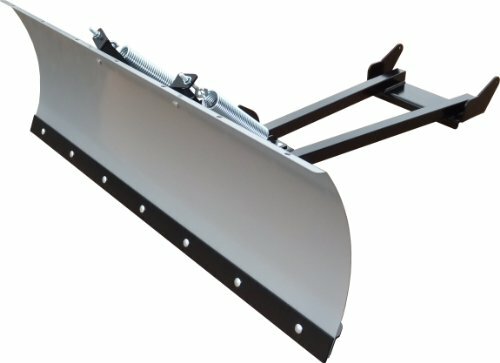 You want a blade and a plow that are fast to attach to your vehicle. How easy it is to do that is also important, as you don’t want to lose the plow on the road because you forgot to screw a bolt. Operating it should also be an easy task. There are plow models that let you choose the angle and make it more convenient for you to direct the snow in the area you want. Small plows offer better maneuverability, particularly in tight spaces. A plow that offers the possibility to change the height at which it operates through a hydraulic system is always desirable. But there are also models that allow that change via a manual system, albeit requiring a lot more brute force to operate. You might also be interested in our guide on four-wheeler tires, so check that out too, if you’ve got the time.